Ripeware creates apps that help people express their ideas. Turn your Mac into a teleprompter. 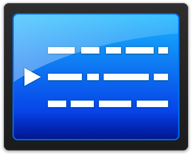 Scroll text smoothly for singers, speakers, newscasters, narrators, or anyone with a script. © 2012-2019 Ripeware, LLC. All rights reserved. Ripeware and the Ripeware logo are trademarks of Ripeware, LLC.